The slickest, most imaginative rat maze ever built. You are in a room with high ceilings. Rubble is all over the floor. Broken panels and sparking wires hang from the walls. Above you, around the walls, runs a rail-less balcony. Higher up, a red laser beam cuts across the room’s empty space. On the ground floor with you, one wall has a glowing blue oval in it, at about your height. On the nearby wall is an identical orange oval. If you step through the blue oval, go to paragraph number 4. If you step through the orange oval, go to paragraph number 4. 2) You aim for the wall along the balcony. Your gunshot opens a glowing blue oval on the wall on the other level, while the blue oval near you crackles and vanishes. As you step through the orange oval, you emerge from the blue oval on the balcony. At this height, you can see the red laser beam shooting across the room and ending harmlessly on the opposite wall. Further along the balcony, you see a sealed door. A switch is on the wall next to the door, but it can only be opened by a laser beam. You decide to shoot your gun at the wall where the laser beam hits it. Go to paragraph number 5 if you pull the left trigger. Go to paragraph number 3 if you pull the right trigger. 3) The blue oval pops out of existence behind you and appears on the wall where the laser beam hits it. Down below, the laser beam shoots out of the orange oval. Because you are getting the hang of things, you decide to pull your left trigger and move the orange oval to a spot on the wall opposite the door’s switch. As soon as you do that, the laser beam hits the switch and opens the door. You walk through the door and take an elevator to another puzzle room. Pretty much go back to paragraph number 1. 4) As you step out on the other side of the oval, you see yourself from behind, stepping into the other oval. You are back in the same room. If you step through the blue oval, go to paragraph number 4. If you step through the gold oval, go to paragraph number 4. If you shoot your gun at another wall, go to paragraph number 2. 5) The orange oval disappears from the ground floor and reappears on the wall where the laser beam hits it. As soon as the orange oval appears, the laser beam shoots out of the blue oval behind you, knocking you down to the ground floor. Go to paragraph number 1. THE GOOD: Portal 2 is the slickest, most imaginative rat-maze ever built. Traveling through portals is challenging enough, and the game mixes it up with lasers, reflective surfaces, bridges made out of light and cooperative puzzles that will quickly test the coordinative powers of even the most sympathetic players. 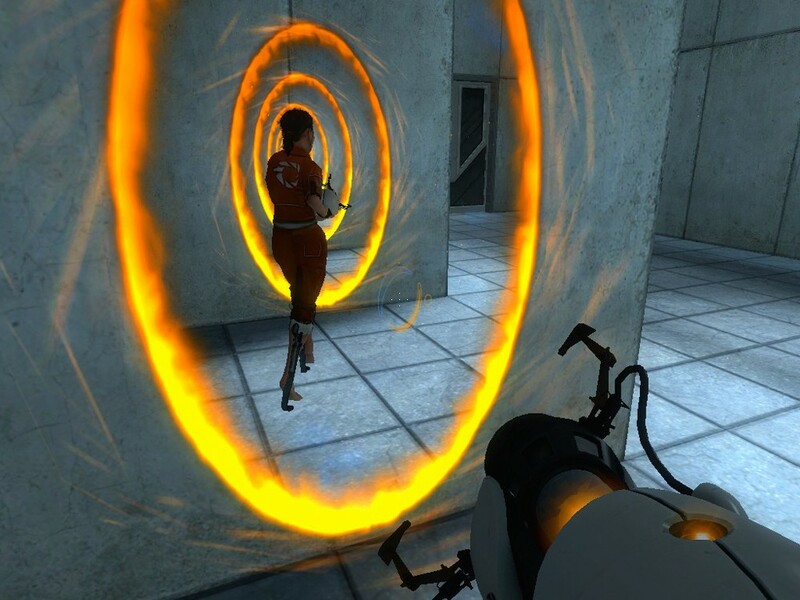 THE BAD: Portal 2’s endless sequence of puzzles quickly becomes tedious. The two-player puzzles are tedious from the beginning and quickly become frustrating. THE BOTTOM LINE: Portal 2 traps players in a 3D rat-maze, but forgets to add the cheese.